Be the first to share your favorite memory, photo or story of Mason. This memorial page is dedicated for family, friends and future generations to celebrate the life of their loved one. 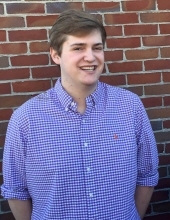 Mr. Mason Ryker Gadbois, age 20, of Rockmart, GA passed away Wednesday, November 14, 2018 at Children's Healthcare of Atlanta at Egleston Hospital. Mason was born in Kennesaw, GA on May 7, 1998, a son of Edward Gadbois and Traci Brown Gadbois. Rockmart had been home to Mason since 2007, moving here from Acworth. He was a graduate of Rockmart High School Class of 2016 where he was involved in Band, Drama and he also enjoyed soccer. He had a love for gaming systems and became a collector, having many at home. Mason was an avid football and basketball fan who loved to cheer on his UGA Bulldogs, Atlanta Falcons and Atlanta Hawks. He was of the Baptist faith and was currently enrolled at Full Sail University in Winter Park, FL for Music Production. He was preceded in death by his father, Edward Gadbois; and grandparents: Wenton Brown, Richard and Kathleen Gadbois, Amy Manley Thompson and Richard Finley Thompson. Mason is survived by his parents, Traci and Jeff Thompson; sister, Meghan Gadbois; brother, Miles Thompson; and grandmother, Judith Brown, all of Rockmart; a number of aunts, uncles and cousins also survive. Funeral services will be held Sunday, November 18, 2018 at 1:00 PM in the chapel of the Alvis Miller & Son Funeral Home. The family will receive friends at the funeral home on Sunday following the funeral service. In lieu of flowers donations may be made in Mason's memory to Georgia Transplant Foundation, 2201 Macy Dr., Roswell, GA 30076 (www.gatransplant.org). The Alvis Miller & Son Funeral Home is in charge of arrangements for Mason Ryker Gadbois. To send flowers or a remembrance gift to the family of Mason Ryker Gadbois, please visit our Tribute Store. "Email Address" would like to share the life celebration of Mason Ryker Gadbois. Click on the "link" to go to share a favorite memory or leave a condolence message for the family.